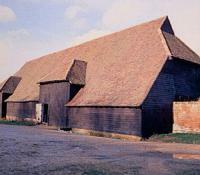 Coggeshall Grange Barn is one of the oldest timber-framed Barns in Europe, dating from the 13th century. It was the barn of the Cistercian monastery of Coggeshall. The Barn has a magnificent interior with early timber joints and it contains a collection of farm carts and wagons, and displays of barn restoration. Parking available during barn opening times. Signposted off A120 Coggeshall bypass. ½ ml from centre of Coggeshall on Grange Hill (signposted).